Trump ordered the strikes after a reported chemical weapons attack by the Syrian regime against civilians in the town of Douma on April 7. U.S. intelligence confirmed the attack, officials said. 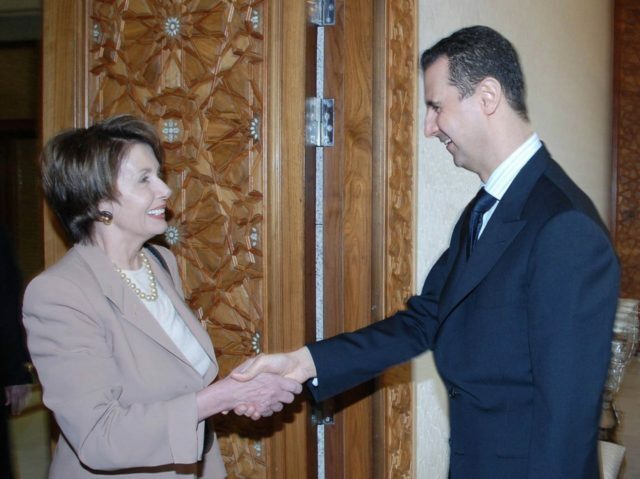 Pelosi has long been one of the foremost opponents of military action against the Assad regime. In 2007, shortly after becoming Speaker of the House, she traveled to Syria to meet with Assad personally. The trip took place at a time when the George W. Bush administration was frustrated about Syria’s efforts to help terrorists enter Iraq. Pelosi and several of her fellow Democrats traveled to Syria in a protest against any potential military action against Assad, and to highlight diplomacy as an alternative. Other prominent Democrats who traveled to meet with Assad included former President Jimmy Carter and former Democratic presidential nominee — and later Secretary of State — Sen. John Kerry (D-MA). As Secretary of State, Kerry would broker an agreement with Russia that supposedly guaranteed the removal and destruction of Syria’s chemical weapons. That agreement, seen at the time as an alternative to military action, was quickly violated by the Syrian regime. According to the San Francisco Chronicle, Pelosi said that Trump was abusing a 2001 congressional authorization of the use of military force against terrorists to target Syria. She said that Trump could not act against Syria without specific approval from Congress. Pelosi is currently favored to become the next Speaker of the House, according to polls that show the Democrats winning the lower chamber in the 2018 midterm elections.